This is Sou, the latest bear in our new collection, "Coins". He is made of two-tone German mohair, dark olive green backed with a very short pile in a vibrant shade of purple. His tummy and ears are made of pale grey silky mohair with a much longer pile length which gives him those ears that so many of you love! He has pale grey ultrasuede pads and paws, a grey stitched nose and shiny black German glass eyes. We have filled Sou with steel shot which gives him a great weight for his size. 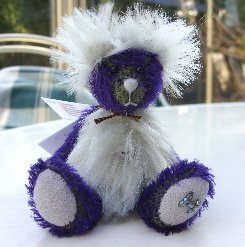 He is a very sweet little bear and I do hope that you like him, he costs just £35 plus postage. Please note that as with all our bears, Sou is not a toy and is not suitable for children. Sorry - Sou has been adopted.